For many of us in the higher education world, the release of the newest wave of the National Postsecondary Student Aid Study (NPSAS) is something akin to a national holiday. The NPSAS is a nationally-representative dataset of both undergraduate and graduate students that has provided a snapshot every four years of the state of how students pay for higher education. (Going forward, there will be a new dataset produced every two years, which is great news!) The 2015-16 NPSAS dropped on Tuesday morning, which sent nerds everywhere running to their computers to run numbers via PowerStats. 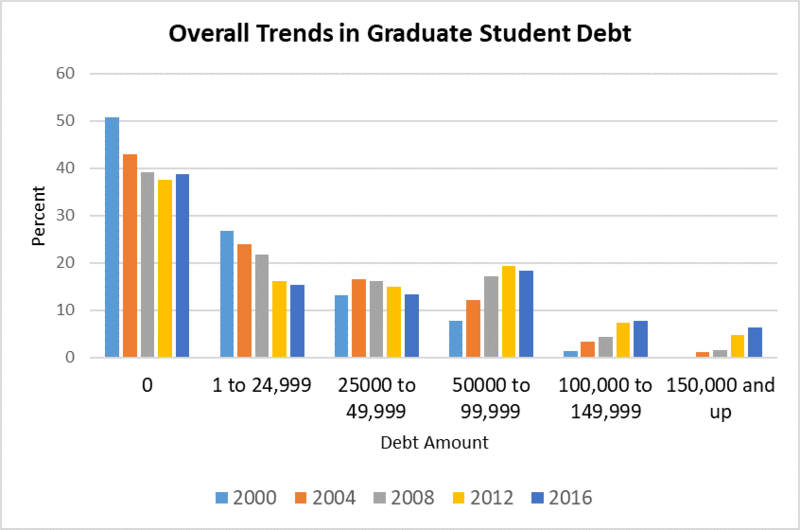 In this post, I look at graduate student borrowing, which is of increasing interest to policymakers given the average size of graduate student loan burdens and the potential implications for taxpayers thanks to income-driven repayment and Public Service Loan Forgiveness. I used the TrendStats tool to look at graduate student loan debt by race/ethnicity every four years from 2000 to 2016, based on concerns raised by Judith Scott-Clayton about the growth in student debt among African-American students. I broke down the borrowing data by race/ethnicity to look at the percentage of graduate students with no debt at all across each cohort. 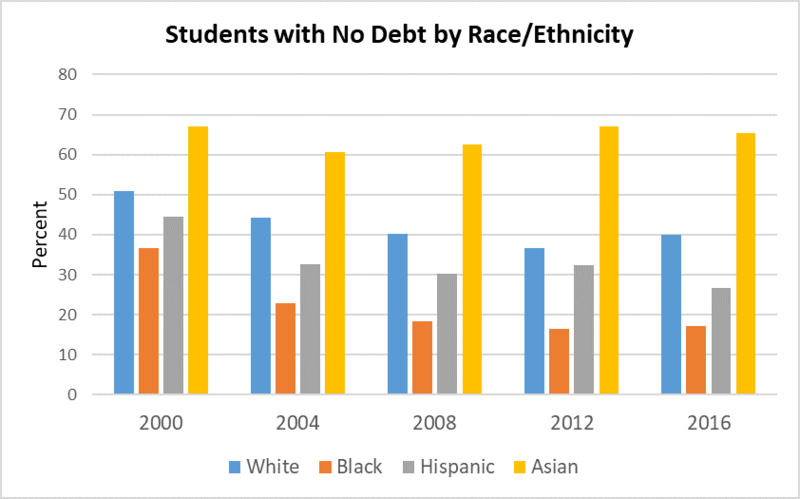 Across each cohort, at least 60% of Asian students had no debt, while the percentage of white students with no debt was 51% in 2000 before meandering around 40% in more recent cohorts. Forty-five percent of Hispanic students had no debt in 2000, which steadily fell to 27% in 2016. Among African-American students, however, the percentage with no debt fell from 37% in 2000 to 17% in both 2012 and 2016. Part of this may be due to the higher likelihood of black students to study in fields with fewer graduate assistantships (such as education), but family resources likely play a crucial role here. Finally, I examined the percentage of students with at least $100,000 in educational debt by race and ethnicity. All groups of students started out at between one and two percent with six-figure debts in 2000, but those rates quickly diverged. 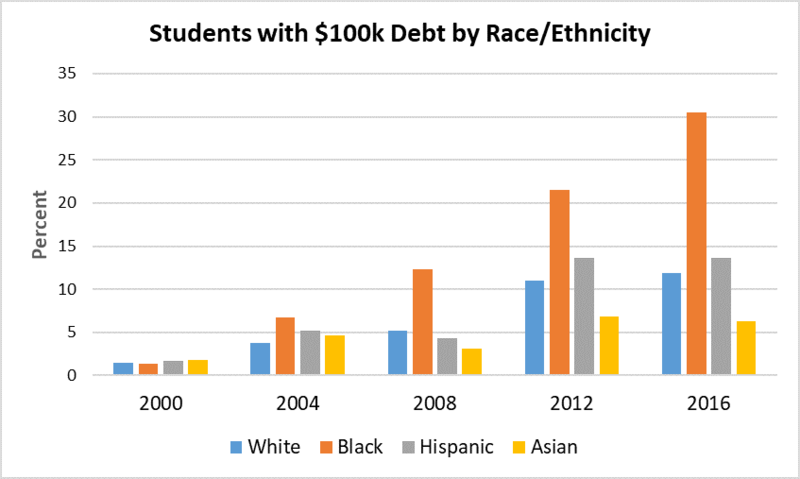 By 2012, 7% of Asian students, 11% of white students, 14% of Hispanic students, and 21% of black students had at least $100,000 in educational debt. In the newest NPSAS wave, all racial/ethnic groups except black students stayed within one percentage point of their 2012 level. But in 2016, an astonishing 30% of African-American graduate students had at least $100,000 in debt—nearly three times the rate of white students. In future posts, I will look at some other interesting tidbits from the new NPSAS data. But for right now, these graphics are so depressing that I need to step away and work on something else. Student loan debt isn’t a crisis for all students, but it’s an increasingly urgent matter for African-American students in particular as well as for taxpayers who will be expected to pay for at least partial loan forgiveness. Note that Grad PLUS lending didn’t really pick up steam until the competition for grad/prof borrowing disappeared: private loan capital hitting the international liquidity freeze in early 2008. (During the credit bubble of the 2000s private lending appeared to actually have weaker underwriting than federal, which has barely any, even for PLUS.) And Grad PLUS was enacted — without any legislative history — at the end of February 2006, with only four months until Award Year 2007 began. The private loan underwriting which emerged after the end of the great recession is more like the private loan underwriting of the 1980s and 1990s. Thanks for the comment. I used the graduate NPSAS sample, so it is current graduate students regardless of where they are in graduate school. So it should be a representative sample of current grad students in 2015-16. You raise a good point about Grad PLUS potentially not picking up steam in time for the 2007-08 NPSAS. Duly noted. I was wondering if these totals have been adjusted for inflation? I always have questions about passing various benchmarks if inflation adjustments aren’t made. Also, 50K intervals can make jumps look bigger. For instance if a large percentage in the priir time frame were in the 90K range, moving to 100K might not be as alarming. Unfortunately, the answer in this case is no. TrendStats didn’t allow for inflation adjustments in the grad student NPSAS when I was running queries. So it’s natural to expect some changes in the categories to be driven by inflation, although this doesn’t affect the graph of the percentage of students with no debt. This data set also breaks out debt by major field of study. I thought it was notable that the amount of debt in each case was inversely proportional to the relative future earning potential of the subgroup (whether ethnic or major). At that very least, this means that those with the most debt will have the greatest burden in repaying. Previous Previous post: Is Administrative Bloat Really a Big Problem? Next Next post: What Explains Racial Gaps in Large Graduate Student Debt Burdens?